So, as you may have seen, today is my last day as an employee. I've had a fascinating time but I've realised that I want to try some different things. I'm going to write, blog, reply to all those people who I owe emails to and try and support myself with some freelance planning. 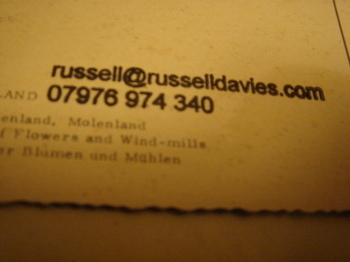 So if you need a couple of yards of consultancy my contact details are above. More details on all that will emerge as they get worked out. And I'd really like to say goodbye and thanks to some of the people I've met in the last year, especially Amanda, Lauren, Jenny, Seb and Acyde. Stay in touch, you've made it all worthwhile. Wow - interesting times ahead Russell. Wishing you all the very best. You are surely a legend in the planning community, so I can't imagine you will be short of freelance work! Amazing. I am leaving my job on 30 June. After 30 years in the biz, I'm taking a three month break and then pursuing business storytelling... more later! I believe the thing is festooned with feeds. Everything typepad and feedburner can supply. Have you tried clicking on that orange thingy on the right? Or used a reader like bloglines? that's what I use to keep up with myself. Or am I being stupid? anyone? Good luck Russell - I'm sure whatever you do will be great. Does the revised blog sub-title give us a clue about your new direction? Charles - it says 'subscribe to my feed' - right next to the orange thingy. Or is that the point you're making? And Mark, thanks, and no, not really, just realised that I'd always promised to change it a lot and I hadnt. Good luck in all your future endeavors! It will be intersting to see your next steps unfold. There are certainly lots of opportunties out there. Here's to the marketing Ronin and bringing about Agency 3.1! Times they are a changing-go get em Russell. I stay away from your blog a couple of days and that's what happens??? Good luck, I wish you all the best and hope you got time to teach us even more. your own man, amen. Good luck Russell. All the very best! May you go on to live in even more interesting times. Great to know you will be working on new things and will keep up with the blog. Good luck and have fun in this new phase. you are high in my shortlist for "people to have a drink with..."
which is my top category in the "people to...."
heavier? heavier?! hang on a minute there james. Oh never mind, that was funny. And thanks for the good wishes everyone. Life's working out pretty well at the moment, apart from not earning any money.